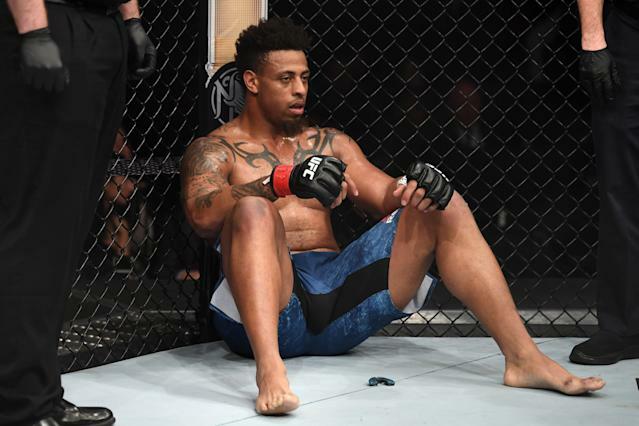 Former NFL defensive end and MMA fighter Greg Hardy is going to try a second time to win his first UFC fight. According to ESPN’s Ariel Helwani, Hardy will face Dmitry Smoliakov at UFC Fight Night on April 27. Smoliakov’s UFC record is 0-2, and he hasn’t fought since January 2017. The first fight in Hardy’s UFC career was against Allen Crowder at UFC Fight Night 143, and it didn’t go according to Hardy’s plan (or anyone else’s). At 2:28 into the second round of the fight, Hardy’s knee connected with Crowder’s head while one of Crowder’s knees was on the ground. That’s an illegal move, and it earned him a disqualification. Not a great start, especially since Crowder was supposed to be a beatable opponent for Hardy, and there were questions about the UFC welcoming an athlete with Hardy’s reputation. Hardy came to the UFC from the NFL. He played for the Carolina Panthers from 2010-14, but his final year with them was played under the cloud of a domestic violence accusation made by his ex-girlfriend. He was found guilty by a judge and was suspended for ten games by commissioner Roger Goodell, but his conviction was eventually expunged and his NFL suspension was reduced to four games for the 2015 season. He played for the Dallas Cowboys in 2015, but he was not re-signed and never played in the NFL again. If Hardy is on the card for April’s UFC Fight Night, it’ll give him another chance to prove that he’s serious about MMA and fighting in the UFC. At this point, it’s hard to imagine that Hardy has many chances left.